Last week I mentioned that I was stuck in a bit of a rereading rut (which I must admit, I have completely enjoyed.) This week I am branching out just a little. I am still doing some rereading but I have added a few new books into the mix. That has resulted in me having way too many books going at once but I can live with that. I am reading Mansfield Park for the millionth time. I recently read Claire Tomalin's book about Jane Austen and then I read a volume of Jane Austen's letters. The obvious next step is to reread Jane Austen's books. I have read them over and over but they never get old. Every time I feel like I notice some new turn of phrase or detail of the story. Her books make me happy. What does not make me happy is the inscription inside this copy. I picked it up secondhand, like most of my books, and this is the first time I have read this copy. I don't know what the relationship is between Sharon and Greg. Husband and wife? Friends? Boyfriend and Girlfriend? Who knows. 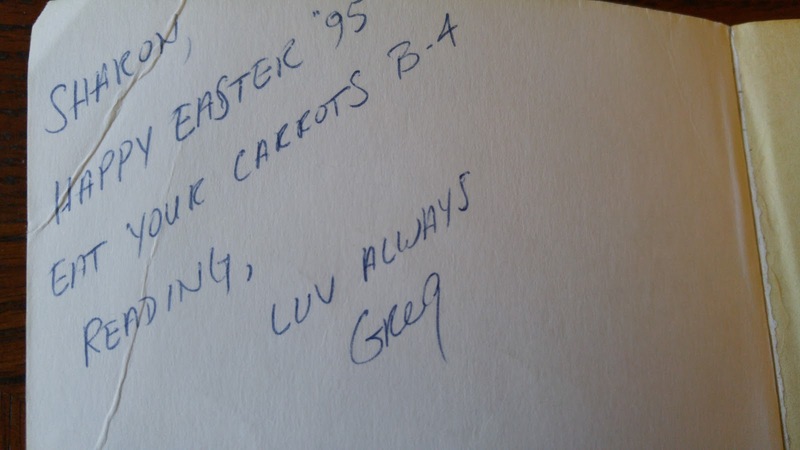 What I do know is that Sharon should get rid of Greg. Anyone who puts "B-4" instead of before and "luv" instead of love deserves to be dumped. And to write that in the front of a Jane Austen novel just makes me cringe. I stopped and thought about what I just wrote and no, I don't think I am joking. 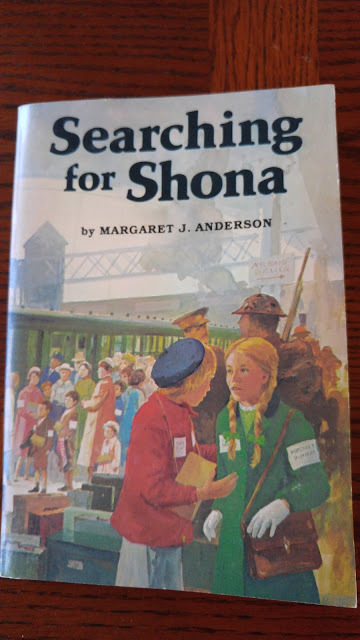 My next reread is Searching for Shona by Margaret J. Anderson. I do like the cover and apparently my obsession with WWII stories started at a very young age. I picked this up off the free book rack at the library for my daughter. I read it when I was about her age. It is about two girls who are being evacuated from Edinburgh during WWII. They decide to switch places, each thinking the other's destination is preferable. If I remember correctly they were both going to relatives who had never met them. They think they will easily be able to switch back but it is years before they see each other again. I found this book quite traumatic when I was young. At the end of the book one of the girls denies her true identity and insists on staying with the family of the other girl. I was very bothered by this. It offended my sense of the correctness of things for the girl's identities to be confused and for them to be living the "wrong" lives. It didn't matter that they had good, happy lives. They were the wrong lives. I am curious to see how I feel about the ending now as an adult and I am also curious to see how my daughter reacts to it. I must admit, I debated giving it to my daughter but I thought that any book that made that big an impression on me was a well-done book and I also knew, even at the time, that my reaction to the book was a little extreme. I am sure a psychologist would have a field day with that. I just started Ancestral Voices by James Lees-Milne. The back cover says it "is the first of three volumes of a diary James Lees-Milne kept from 1942 to 1947 when he was employed to inspect historic buildings offered by their eccentric or impecunious owners to the National Trust. Lively, frank, witty sometimes scandalous, it is immensely entertaining reading." I enjoy reading diaries and that time period is exactly what I like best. I saw this recommended on a blog somewhere at some point but I can't remember where. 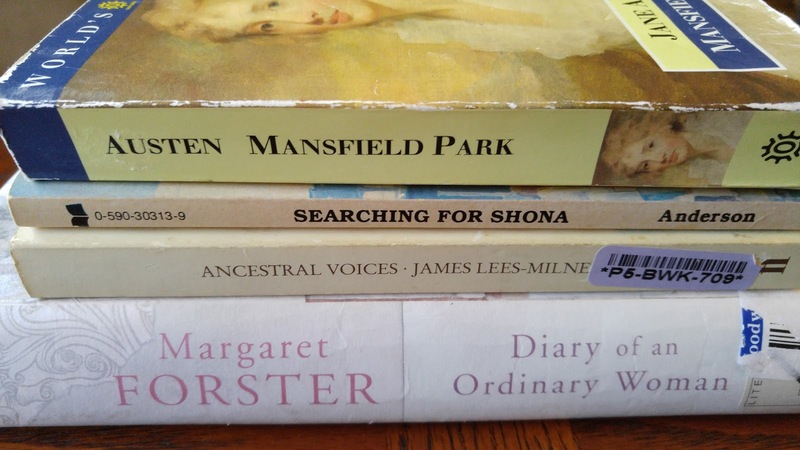 I am also reading Diary of an Ordinary Woman by Margaret Forster. She is not an author I am familiar with at all but my husband heard an old interview with her on the BBC and told me about it. He thought she sounded like someone I would like so I am trying one of her books. This is the fictional diaries of a woman who lived during most of the twentieth century. She records the "dramas of everyday life in an ordinary family touched by war, tragedy, and money troubles in the early decades of the century." I am about a third of the way through it and am enjoying it. It is a light and easy read so far even though the events going on in the world at the time are not light and easy. Maybe that is my complaint. The diary format, in this case, seems to keep everyone and everything at a distance so I don't feel completely involved in the story. I'll see what I think as it goes on. I am also reading a book about photography but that doesn't really fit in with the rest of the books I talk about. It is very useful though. That is quite a variety of books! I never manage that many at the same time - two is my max. Did you get his diaries from Thrift Books? That looks like one of their stickers on the spine. They make me so mad - it's impossible to get those off. I hate those stickers! I spent way too long trying to get all the stickers off the books before I took the picture and then I just gave up. The only thing I hate more is when the library card thingy is stuck right on top of a map or genealogy chart or whatever is on the inside cover. So irritating. The diaries are interesting. I keep marking sentences I like. He knew everybody. He talks about people like Elizabeth Bowen or Ivy Compton-Burnett and lots of other people I have no idea who are. I am still feeling a need to read Angela Thirkell. Maybe The Brandons. 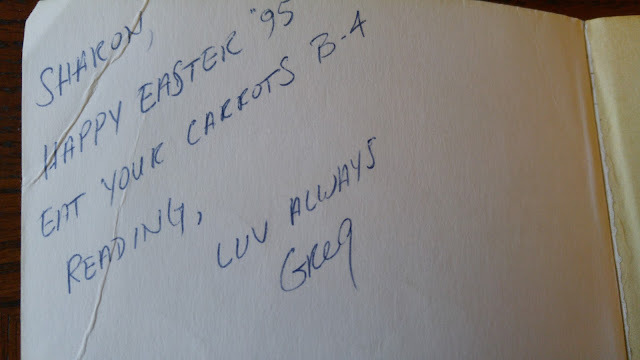 Ahaha, I happen to love the scribbles on my secondhand books. I do find the order to eat carrots rather odd -- what does it have to do with reading? Would you consider reviewing Mansfield Park? I want to read it because, well, it's Austen. But someone dear whose tastes align with mine 99.99% of the time dismisses Mansfield Park as her least favorite Austen. Where does Mansfield Park rank on your list? I usually like inscriptions but this one just irritates me because of the words that are not written correctly. That is one of my pet peeves. I think the carrots reference is because carrots used to be believed to help eyesight. Mansfield Park is by Jane Austen and therefore it must be read! I know it is generally considered the least favorite of her works but the least favorite of her works is still better than 99.9% of the books out there. I think it is a more mature work. Pride and Prejudice is "light and bright and sparkling" but Austen couldn't just write P&P over and over again. I really like Mansfield Park and would be curious to see what you think of it. Actually, I might review it. I am finding I have a lot of thoughts about it now! It definitely made a big impression on me as a child. My daughter just read it and loved it. She wasn't quite sure about the ending either but otherwise she could barely put it down. She tried to convince me she needed to stay up way past her bedtime to finish it.